Millions of people visit Wikipedia every month for information on a wide range of topics. When it comes to scientific topics, Wikipedia is one of the main sources of information available to the public. It is therefore crucial that that information is accurate and comprehensive, especially when readers use that information to make political and behavioral decisions. Conservation efforts rely on an informed public to make real change. One way to ensure that the public is educated about conservation issues is to make well-researched scientific information freely available through Wikipedia. Often, academic research is restricted behind paywalls, which vastly limits readership. A Wikipedia assignment is a great opportunity for those who have access to academic research (i.e. university professors and their students) to synthesize that research in a public forum. Dr. David Die’s graduate course at the University of Miami is doing just that. Students in the course, titled Management And Conservation Of Marine Ecosystems, have improved Wikipedia articles related to conservation as a course assignment. One student improved the article about Ecosystem-based management. As you can see with Wiki Education’s Dashboard “authorship highlighting” tool, the student added almost 4,000 words throughout the article, contributing new content as well as clarifying existing information. Other students expanded the article about the environmental impact of fishing, specifically contributing content about the effects of commercial fishing (versus recreational fishing) on marine habitats. Commercial and recreational fishing are subject to different levels of regulation. Recreational fishing tends to not be as regulated, but still contributes to habitat disruption, problems caused by overfishing, and the killing of fish. However, most detrimental environmental effects caused by fishing are done in a commercial context. This is due in part to the sheer amount of fish that commercial projects seek to collect and sell. This article has been viewed 19,292 times since these students began working on its improvement. Another student improved the article about U.S. Regional Fishery Management Councils, and uploaded a map of these councils to Creative Commons, to illustrate the article. A map of the area managed by each U.S. Regional Fisheries Management Councils. Image: File:Boundaries of the U.S. 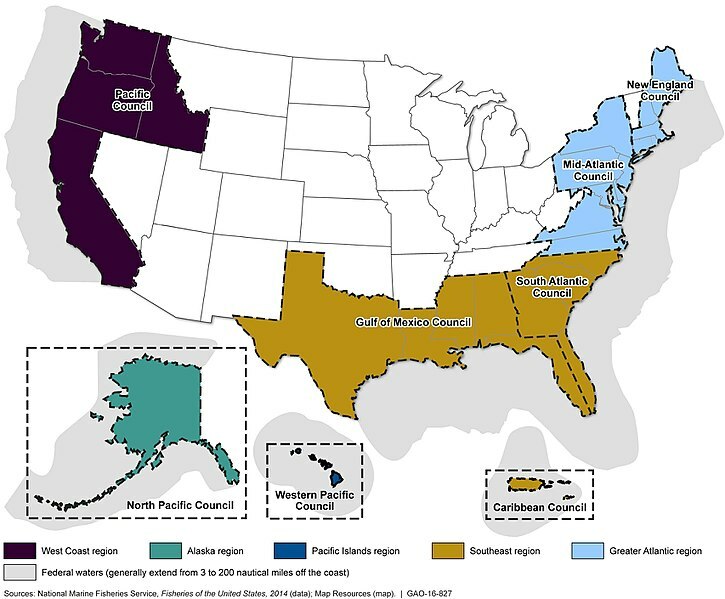 Regional Fishery Management Councils.jpg, U.S. Government Accountability Office, public domain, via Wikimedia Commons. With the free tools and support that Wiki Education provides, instructors feel supported in incorporating a Wikipedia assignment into their existing curriculum. The assignment is not only a great opportunity for students in directly impact public knowledge, but they also develop critical skills through the process – including digital literacy, collaborative writing, and research. To learn about how you can teach with Wikipedia, visit our informational page at teach.wikiedu.org or reach out to contact@wikiedu.org with questions.